In 2008 a very memorable event took place: His Holiness the Dalai-Lama came and blessed the Aubry-le-Panthou site. In 2010 after reassessment of the costs and building techniques, the construction project was declared officially open. At this stage the work was to build an environmentally friendly water-treatment plant. 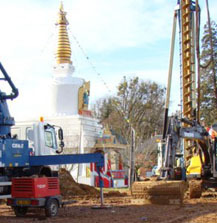 A few months later, two ceremonies – one at Kagyu Dzong in Paris and the other at Vajradhara-Ling on 19 Dec 2010- were held to announce the laying of the foundations. The work continued despite a very bad snow storm. The building will rest on a system of concrete piles much like the technique used to build Notre Dame but at the time oak piles were used. The necessary contracts were put in place in order to begin construction. The foundations were made in 2011. The fitting-out works and securing of the outside zones have been done. From December 2012 to July 2013 the linking and reinforcement of the foundation piles were carried out. 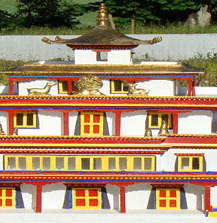 A technical room has been created and will serve as a base for the statues to be installed on the ground-floor level of the Temple. En February of 2013 His Eminence Kalou Rinpoché visited and blessed the Temple construction site. In 2014 the venerable Lama Gyourmé created a prayer wheel, powered by water from springs just down the hill from the Temple. 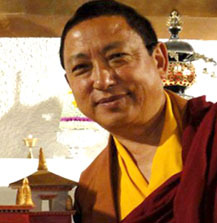 During his teachings on Mahakala in March 2015, Kalou Rinpoché was able to admire the prayer wheel which has never stopped turning, meaning it has diffused its messages of peace and compassion for the world without interruption since its inauguration. In May 2015, His Eminence Djetsun Khandro Rinpoché dedicated the Prayer Wheel. 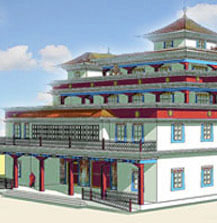 Soon we are going to begin the second phase which means building the main frame of the Temple. For this, we will again be in need of your support.